This fun-packed trip includes some the best highlights of the island of Tenerife, a perfect family destination in the Spanish Canary Islands. First, a group whale watch is one of the “must do’s” while in Tenerife. Just a short 45 minute boat ride away, spot non-migratory Bottlenose dolphins, Pilot whales, and 21 other marine species that are unique to this area. Since these beautiful creates don’t migrate, this means that visitors are practically guaranteed to spot marine life every day of the year! You’ll also have an opportunity to visit the main tourist center on the northern part of the island, Puerto de la Cruz, where you can check out Loro Parque, a world-class attraction that was originally intended to be a refuge for parrots. Today, the park houses an immense diversity of animal species, integrated amidst palm trees and other exotic plants. Its commitment to conservation and sustainability has made Loro Parque one of the most recognized zoos in the world, boosting over 44 million visitors since its gates first opened in 1972. Also included is a trip to Siam Park. This park was recently named the number one water theme park in the world by TripAdvisor. The exceptional Thai architecture, lush vegetation and the white sand and turquoise waters of Siam beach truly stand out. Arrive at Tenerife South and enjoy the ride to your resort on the south of the island in Costa Adeje by private car. Once you check in, you are free to explore the area or relax with a poolside cocktail. The rest of the day is yours to enjoy! Explore Garachico’s natural lava pools in this colonial port that was once home to the American colonists and gateway for trade between Europe and the New World in the 16th and 17th centuries. It is known for its many wine shops and also home to the oldest living Roca tree, just one of the many species of exotic and unique flora and fauna in this fertile Mediterranean climate. Then off to the Cave of the Wind. Thought to be the largest volcanic cave in the world, the Cueva del Viento (Cave of the Wind) has a known length of over 17 kilometers. It consists of a complex lava tube with several entrances, is the largest lava tube in the European Union. It presents great internal complexity, a wide variety of geomorphological structures, and a unique fauna, both living and fossilized. Other caves, also very extensive, are found in other nooks of the town: these include San Marcos, Punto Blanco, El Rey, and Felipe Reventón. Next, we take the curvy road to Masca. At an altitude of 600 meters, Masca is a small village at the foot of the Teno Mountain range where Tenerife’s original settlers lived. The sight of Masca’s homes perched on narrow mountain ridges along with deep cypress and palm tree covered ravines make this one of the most picturesque parts of the island. The strait dividing Tenerife from the island of La Gomera is populated with one of the most important colony of pilot whales on the planet together along with Bottlenose dolphins. Up to 21 different species of mammals live in these waters, meaning that visitors are practically guaranteed to spot free-living dolphins or whales on any wildlife spotting excursion that sets sail from southern Tenerife every day. Take this day to explore the island as you see fit. Shop in the many boutiques. Experience the rich history of La Laguna. Or just relax. Lounge by the pool or go to the beach. After breakfast, depart for Loro Parque, a world-class attraction that was originally intended to be a refuge for parrots. Today, the park houses an immense diversity of animal species, integrated amidst palm trees and other exotic plants. Its commitment to conservation and sustainability has made Loro Parque one of the most recognized zoos in the world, boosting over 44 million visitors since its gates first opened in 1972. After your included breakfast, you'll enjoy a lesiurely morning to yourself where you can walk around the seaside boardwalk or enjoy the pool with a magnificent view of La Gomera in the background. This afternoon you'll visit Las Cañadas National Park, home to Mt. Teide, declared a UNESCO World Heritage site in 2007. This park is characterized by its unique lunar landscape and flora and fauna, seen nowhere else on earth. Once in the park, pass the Chinyero volcano (site of the last major volcanic eruption in Tenerife in 1909), and stop at Roques de Garcia, where you can admire the view of Mt. Teide from 3,718 meters high. If the weather is good, you'll have the option to take the cable car to the summit of the volcano. You'll enjoy the beautiful sunset overlooking the other Canary Islands and can stop to take memorable photos at a few of Mt. Teide’s stunning vistas. Later, you’ll enjoy a cocktail dinner, followed by a stargazing session guided by a professional astronomer where you'll be able to gaze stars, planets, galaxies and constallations that you can't see anywhere else on the planet. Tenerife is one of the best locations on the planet for stargazing because of its clear dark skies, low light pollution and a high altitude. Siam Park is recognized by TripAdvisor as the best water theme park in the World! The exceptional Thai architecture, lush vegetation and the white sand and turquoise waters of Siam beach truly stand out. If you're daring enough, make sure to try out the Volcano or Dragon rides! Includes: Breakfast, Siam Park entrance fee. After breakfast at the hotel, visit La Gomera, an island of hidden beauty. Discover and explore this island in chauffeur driven jeeps, enjoying the open air and panoramic views. Enter the Garajonay National Park and be amazed by the ancient rain forest, visit small and tranquil villages, sample traditional Gomeran cuisine in a local restaurant and discover ancient legends while learning about the fascinating whistling language which you can only find on this island. This language, called "Silbo" is on the UNESCO List of Intangible Cultural Heritage of Humanity. There is also time to explore San Sebastian, the islands capital city, once visited by Christopher Columbus on his way to discover the new world. Step back in time and discover the unique charm and dramatic scenery of this unspoiled island. Includes: hotel pick up and drop off, ferry transportation to La Gomera, transportation within the island, lunch, and a demonstration of the Silbo language. 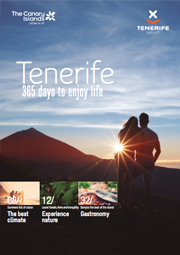 Upon completing your Tenerife adventure, time to return home!